In Scott Westerfeld's latest book, an alternate world to our own is on the verge of World War I. Europe is divided into the Clankers, countries who favor advanced fighting machines and more modern technology, and the Darwinists, those who have embraced Charles Darwin's advanced scientific discoveries to engineer animals and ecosystems as fighting machines. Two teens—royal and wanted Alek who sides with the Clankers, and Deryn, disguised as a boy to join the British Air Service and is a Darwinist through and through—meet in the great airship Leviathan, and when they do, their lives and the war are forever changed. Like all of his other books, Scott Westerfeld's latest novel is adventurous, high imaginative, and wonderfully written. This book has so many elements that will draw in a wide range of readers: absorbing battles and escapades, political intrigue, mysteries, and intriguing scientific and mechanical descriptions that are just downright fascinating. But not only is Leviathan a gripping read for all of its action and ingenuity, it is also extremely appealing because of its two main characters, both young, bold teens who are in the midst of growing up, realizing their place in the world and defying conventions. Alek is a spoiled prince in the beginning of the novel, but having to run for his life causes him to think long and hard about his role and his country. Deryn is a spunky, humble, and down to earth girl whose courage is admirable and whose use of slang adds life and humor to the novel. 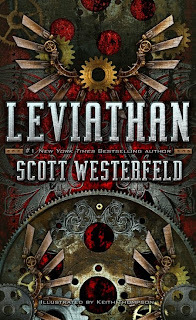 Leviathan is an exceedingly clever, absorbing, and quirky read that has the perfect balance of dated and advanced technology and ideas, and humor and serious plot twists, making for the perfect steam punk read. Cover Comments: I love the use of color on this cover, and how bold and detailed it is. It grabbed the attention of my non-reader of a brother even and had him exclaiming over it. The best part about this book is that drawing of this style, done by Keith Thompson, are displayed throughout the book, making it that much easier to picture all of the fantastic things Westerfeld describes. This is an excellent cover, I love it! I cannot wait to read this one! I'm looking forward to this! Thanks for the review! I loved this book, and I am glad you did too. I am sooo looking forward to Behemoth. I LOVED this book. I knew going in that it was part of a trilogy, but somehow I expected it to be complete in and of itself, a la Uglies or The Hunger Games. I could just kill Mr. Westerfeld, except that if I did that, I'd never find out what happens in books 2 & 3. :) Glad he's such a fast writer, not so glad I have to wait. It was great, I agree. Also, I don't know if I've mentioned this, but I really heart your blog. Like, a lot. :) Good job!